Built-in Phone System: Phone bank the way best for you — at home or at headquarters. Call lists via VoIP, mobile, or landlines. Predictive Dialing: Set up predictive dialing through the system to complete more live calls. Phone banking is another powerful tool to reach out and build a relationship with your voters. 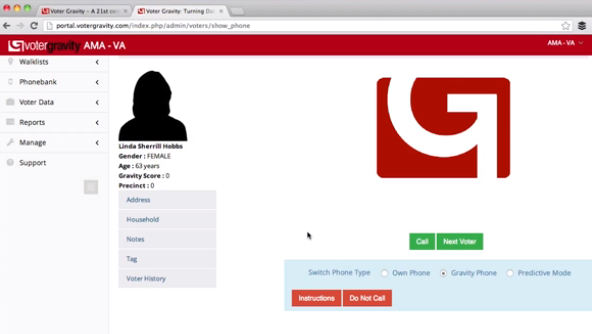 Watch this video in which I explain just how you can maximize your impact with Voter Gravity’s Phone System. “Virginia’s gubernatorial elections just weeks ago offered the first test of whether the GOP had learned its lessons from 2012—and an honest assessment shows more work to be done. Democrat Terry McAuliffe scaled down Obama’s model, contracting with BlueLabs, an analytics and data company started by some of Obama for America’s senior analytics staff, and fundraising and get-out-the-vote firm NGP VAN to model and target Virginians. McAuliffe ultimately won by less than 2.5 percent. Winning elections isn’t just about contacting voters. It’s about building relationships with supporters, contributors, and other key contacts who may or may not be voters in your district. Today we are excited to announce a brand new feature in Voter Gravity that gives campaigns and organizations the ability to integrate all of their data into one place. 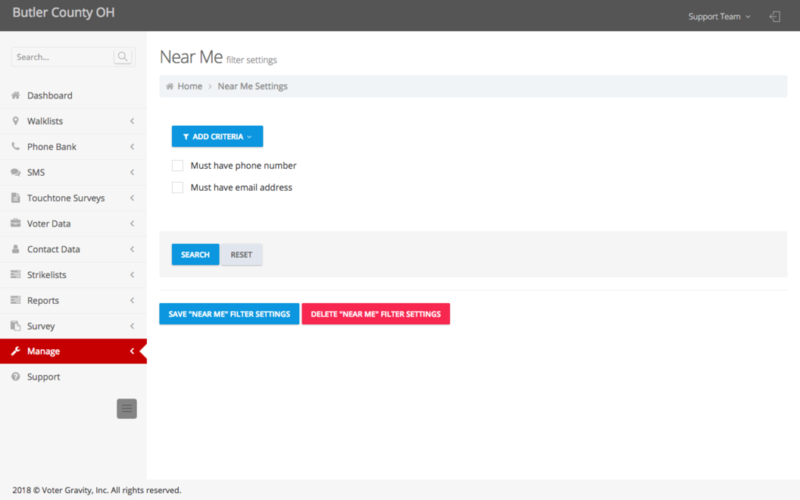 The new Voter Gravity Contacts module gives you an easy place to store your campaign’s contacts, manage donors, and keep in touch with the people most important to your campaign. The Contacts module is a lean tool today, and we will be adding new functionality to it in the coming weeks. Take Voter Gravity Contacts for a spin. Sign up for a free demo today! We’re really excited to share that we’ve recently raised $2 million in partial close funding with a goal of doubling that. It’s exciting to reach this new stage of growth, and we’re grateful for our friends, family, investors, partners, and users who have helped us get to this point. 2. Quick Login: If you have access to only one account, you no longer have to select that account before logging in. The system will log you in immediately after you enter your username and password. 3. 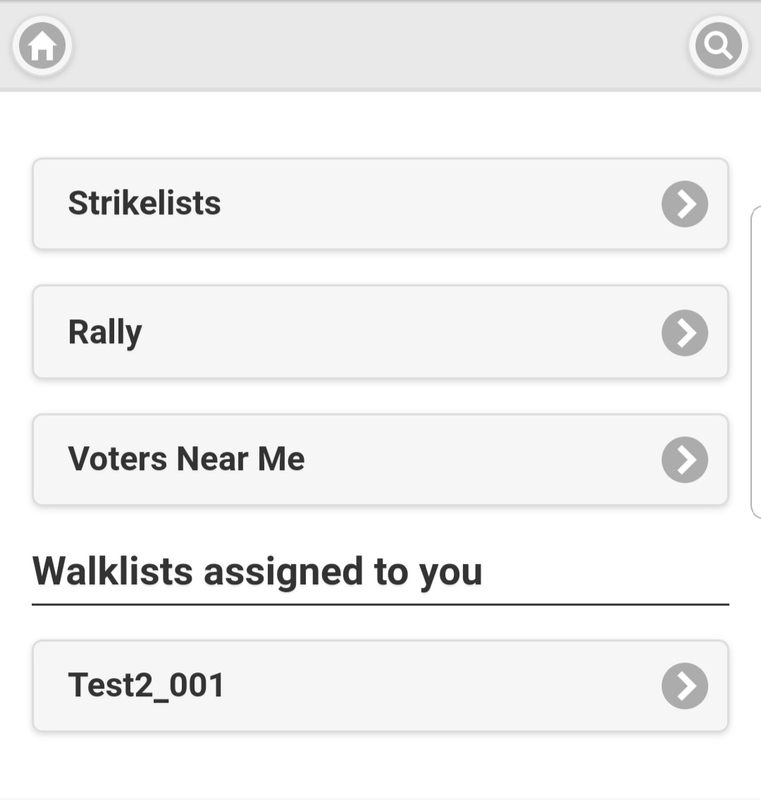 Walklist Updates: Printed walklists now display the tags associated with each voter, so a canvasser will know more about that voter as they go up to the house. 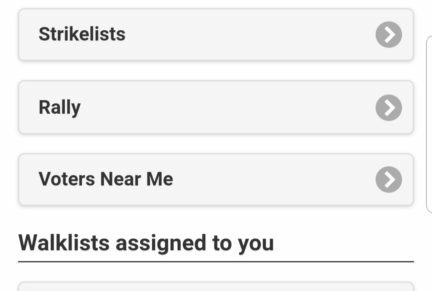 Admins can determine which tags appear on the walklists by going to Manage > System Tags and hiding any tags they don’t want volunteers to be able to see. To keep up-to-date with the latest changes in Voter Gravity, visit our Support Portal. Here’s to using the best political technology to increase that person-to-person interaction, build meaningful relationships, and win! The survey is a critical tool for campaigns to use when going door-to-door or phone banking. Campaigns of all sizes benefit from determining – and recording – the issues with which their voters identify most strongly. The ability for candidates to create their own customized surveys for their unique campaigns is something we’re very excited about. Campaign staff can easily build surveys through Voter Gravity, allowing you to connect with voters and gather the data that will best serve your campaign! Check out my “how to” video on the step by step process of building a survey. Another week, another new Voter Gravity feature. Imagine a volunteer named Nancy calls on Wednesday morning. Nancy is at home and wants to help the campaign starting immediately. In fact, she wants to go knock on doors. In a traditional campaign, she would have to drive to a campaign headquarters, sign up, get a walk list, and then go to a strange neighborhood and knock on the doors of people she likely does not know. Once Nancy has been added to a campaign’s account as a volunteer, she can log in to the Voter Gravity mobile app via her smartphone. After logging in, Nancy can select “Near Me” and Voter Gravity will dynamically create a list of targeted voters close to her location. She’s out the door and talking with neighbors, where she is likely to have relationships with people who will trust her — and be more likely to support her candidate. But who is a targeted voter? That’s easy, campaigns just select a set of filtered criteria via the portal, just as they would to create a targeted walk list or phone bank. Request a demo today to check out this new feature and the other innovative voter contact tools available on the Voter Gravity platform. 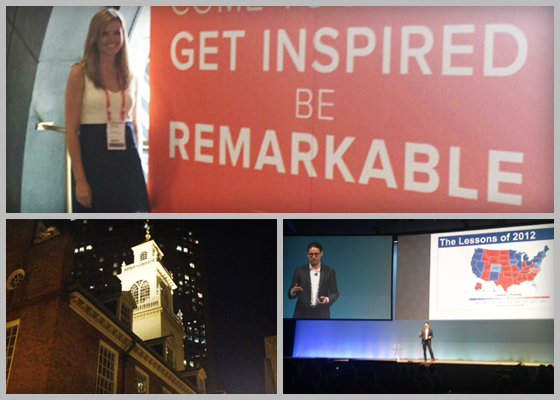 Voter Gravity staff spent a week in August in Boston, connecting with innovators from across the country while attending INBOUND 2013, the world’s largest inbound marketing conference. Interacting with keynotes like social marketer Seth Godin and longtime-leading statistician Nate Silver, we came away with an even stronger sense of why mastering advancing technology is a must for modern political campaigns. We live in an “attention economy” — Americans tune out paid advertising (including TV ads and intrusive robocalls). Buying attention doesn’t work. So what does work? Seth Godin defined this digital revolution: “We are leaving the industrial economy and entering the connection economy.” Data reveals that 92 percent of American consumers trust recommendations from family & friends when making a decision. It’s the personal connection. One of our must-see keynotes was Nate Silver who focused on prediction (of course!) and bringing meaning from a universe of noisy data. Big data becomes useful when we think in terms of actionable knowledge and statistics. Don’t be afraid to test, measure, try and err to determine how data will enable you to establish meaningful connections with your target audience. Stay tuned for more takeaways on how to use technology to effectively reach your voters over the next few weeks!